March 14, 2017 -- School public health nurse Carol Hutchinson knew flu-like illnesses were spreading in her area of Virginia in late February, long before she felt symptoms. The 61-year-old had a host of symptoms -- chills, fatigue, body aches, dry cough, headache, and, after several days, nausea and diarrhea. “It was like a flu. I had symptoms for 7 to 10 days, but the worst was about 3 days,” she says. “It was pretty bad." Although CDC statistics for the week ending March 11 show that flu activity decreased, the number of people seeing health care providers for influenza-like illness, or ILI, was high for the 13th straight week, particularly in parts of the South and Southeast. Infectious disease expert William Schaffner, MD, calls this year’s season “moderately severe” and continuing in most parts of the country. “Flu and ILI will be with us through March and likely into April,” says Schaffner, a professor of medicine in the division of infectious diseases at Vanderbilt School of Medicine in Nashville. But what exactly is “flu-like illness”? The flu is diagnosed with a test -- a swab of your nose or throat. The CDC says that with ILI, you have a fever (temperature of 100°F or higher) and a cough or sore throat without a known cause. “To say someone has influenza requires they be tested and have a positive result. In the absence of testing, ILI is what we call a clinical definition. You can make the diagnosis by talking to someone or examining them. It’s easier to do and free because it requires no testing,” explains Ephraim Tsalik MD, PhD, an infectious disease doctor at Duke University Medical Center in Durham, NC. So “flu-like illness” is a wide-ranging category that may involve other viruses with similar symptoms or patients who probably have the flu but didn’t get a flu test. “You don’t know exactly what the diagnosis is, and a test hasn’t been done that explains (it),” adds Schaffner. Flu tests and a definitive diagnosis can give some peace of mind and could be important for seniors, pregnant women, or people who have chronic conditions that may call for more oversight and treatment. Test results also help officials figure out if there is a flu outbreak in the area. But many patients are said to have a flu-like illness when they and their doctors decide not to bother with a test. Some opt out if symptoms have been present for several days, since antiviral medications like Tamiflu only minimize symptoms when taken in the first 48 hours. 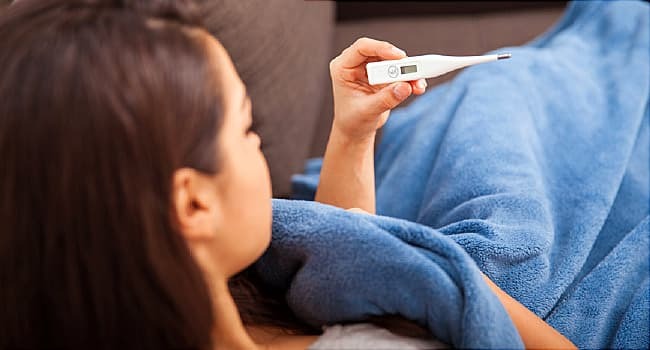 Other times, people decide to skip the time and expense of a test since treatment is generally the same regardless -- rest, fluids, over-the-counter medication to manage fever and other symptoms, and time to let the illness run its course. Although it's late in the season, the CDC says getting a flu vaccine can give you some protection. The vaccine takes 10 days to 2 weeks to be effective, and it cuts your odds of getting the flu by about half (48%). If you do still get sick this season, seek immediate medical help if you get dehydrated or have trouble breathing. Flu can cause pneumonia, and that can be severe. If it is more of a typical case, the No. 1 tip from doctors is stay home so you don’t spread it around. “We generally say people should self-quarantine and stay out of the public for at least 24 hours after they stop having a fever without fever-lowering medicine,” Tsalik suggests. Susan Eller, who lives near Atlanta, followed that advice when a flu-like illness swept through her house in late February, afflicting her kids first, and then her. Eller was better in a few days. And while she’s had a lingering cough, she’s ready to move on to spring. “I’m hoping that was it. I’m hoping we don’t get anything else gnarly,” she says. Ephraim Tsalik MD, PhD, Duke University School of Medicine, Durham, NC. William Schaffner MD, Vanderbilt University School of Medicine, Nashville. CDC: “Key Facts About Influenza (Flu)" “Situation Update: Summary of Weekly FluView Report for week ending February 25, 2017,” “Diagnosing Flu,” “2016-2017 Influenza Season Week 8 ending February 25, 2017,” "Overview of Influenza Surveillance in the United States."